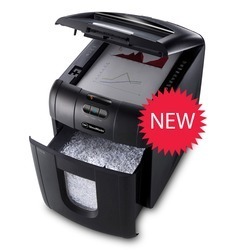 Auto feed shredder releases you from the dreary job of standing and feeding the shredder. Simply open the lid, drop in your stack of paper, close the lid and you’re done - on your way to do more productive tasks.Choose the auto feed shredder to fit your space, from a 60 sheet under-desk necessity to the 750 sheet shared space powerhouse. Stack-and-Shred auto feed shredders get every document security job done.Contact SASCO to find more about these autofeed shredders and the one which is right one for you. 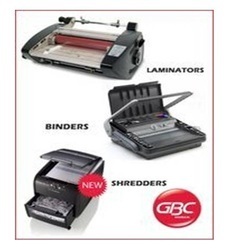 All these products are trendsetters in their segments, GBC dedicates a very large amount of research and development of products leading to very innovative and user-friendly machines which last longer than ordinary office equipment. Their CATENA series in laminators, MERCURY series in shredders and MAGNA PUNCH series in binders are exemplary products, We have their India specific products and offer them at very low prices to the entire spectrum of users from offices to print finishers. If you are looking for a GBC product do contact us for prices, demo and delivery schedules, compare us with the rest and see the difference! 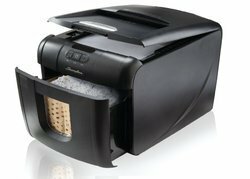 The Swingline® Stack-and-Shred™ shredder with anti-jam from America's #1 Selling Brand in Auto Feed Shredders works without your supervision; just stack, shut and you're done. Stack up to 100 sheets in the auto feed tray and let the micro-cut 100M automatically shred for you. Manual feed shreds up to 6 sheets including glossy, folded or crumpled paper.